BTCC new boys United Autosports were already a highly respected professional racing team before making its tin-top debut this year, but the Yorkshire-based outfit’s reputation continues to go from strength-to-strength after producing a herculean effort over the past eight days. When James Cole’s Toyota Avensis was completely destroyed during race two at Donington Park less than two weeks ago, after both he and the Audi S3 of Robb Holland made unfortunate contact through the Craner Curves, it looked as though the team would be facing a race against time to be ready for Thruxton. Despite confronting a monumental challenge the squad will be on the grid this weekend with both of its drivers after practically building a completely new car for Cole. After sourcing a shell from Speedworks the squad has since worked round the clock to ensure that Liverpudlian Cole will join his Scottish team-mate Glynn Geddie at the fastest circuit in the UK this weekend. 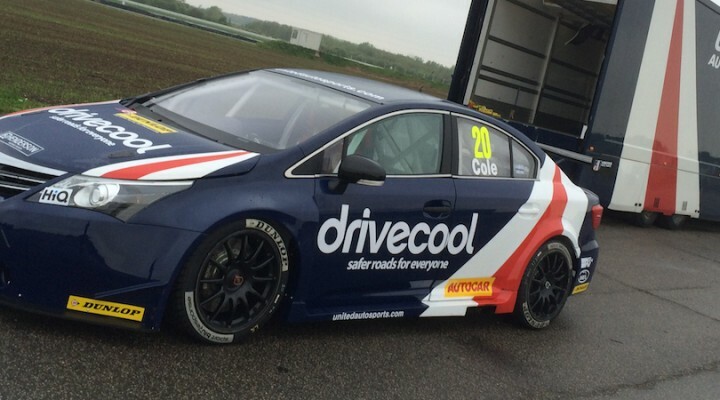 “I’ve shaken the car down and we’re ready to go,” enthused Cole. “We obviously have to say thank you to Tony Hughes and everyone at Speedworks for loaning us the shell, but I have to also congratulate all at United Autosports for the incredible effort put in. Thruxton will be the team’s third event in its BTCC baptism with Geddie’s 13th place in race two at Donington Park representing the squad’s best result so far. The team has shown well on the circuit, but there’s little doubting that the off-track workload has proved the biggest challenge in the last week or so. Richard Dean, Team Owner and Managing Director, said: “Having to virtually replace James’ car after his accident at Donington was a huge task for the team, but one we have faced head on and completed. With the Donington/Thruxton schedules and only taking delivery of the new shell last Wednesday, we had 8 days to turn this around. The car was completely stripped down and the parts we could use again, such as the gearbox, some suspension components and electrical parts were salvaged. We had to have a new engine as this also suffered substantial damage and obviously a new shell, as the crash had caused damage to the roll cage and all the suspension pick up points, even the throttle pedal had broken in two! United Autosports complete a 30-car strong field at Thruxton after the other car unfortunately involved in the aforementioned accident had to be withdrawn – see separate story on Rotek Racing.